Book NOW and get a GREAT Discount! Book NOW and get a GREAT Discount! valid from 21 Mar,2019 till 14 Nov,2019. 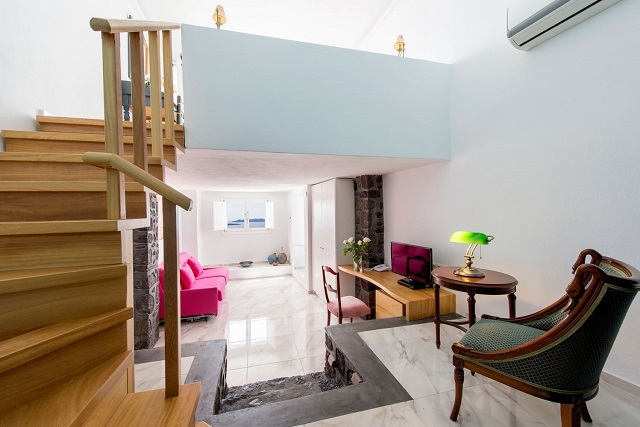 The 18 sq meters Single Rooms features free wi-fi, en suite bathroom with free toiletries, air conditioning and large balcony overlooking the Caldera. 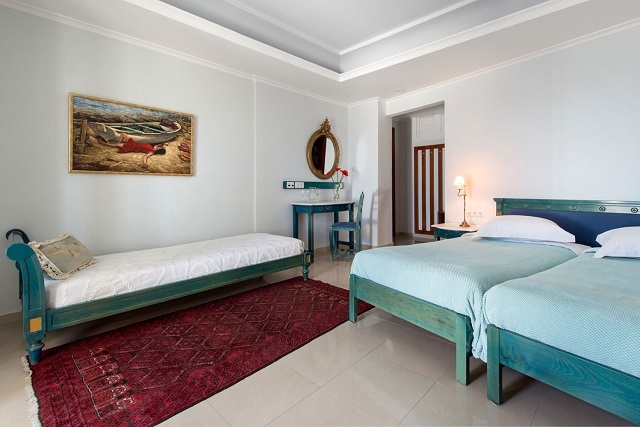 The 22 sq meters Double Room opens to furnished balcony with Caldera Views, Flat screen TV, free wi-fi, en suite bathroom with free toiletries and air conditioning. 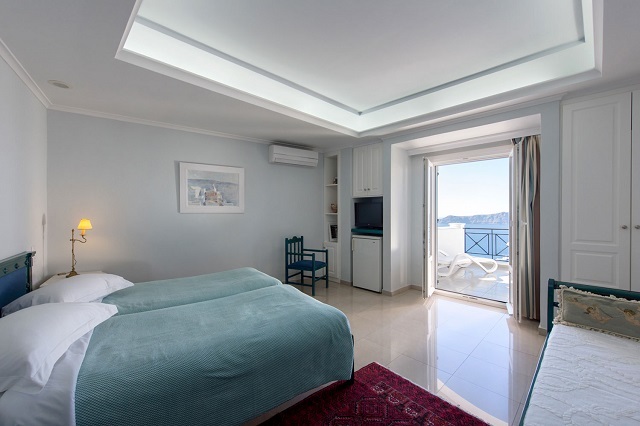 Deluxe Room comes with an outdoor whirlpool overlooking the Caldera and Aegean Sea, flat screen TV, free wi-fi, minibar, en suite bathroom with free toiletries and airconditioning. 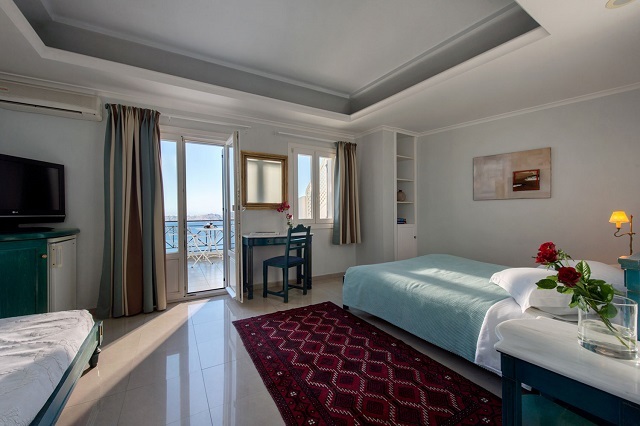 Triple Rooms offer free wifi, airconditioning, en suite bathroom with toiletries, air conditioning and large balcony with Caldera views. 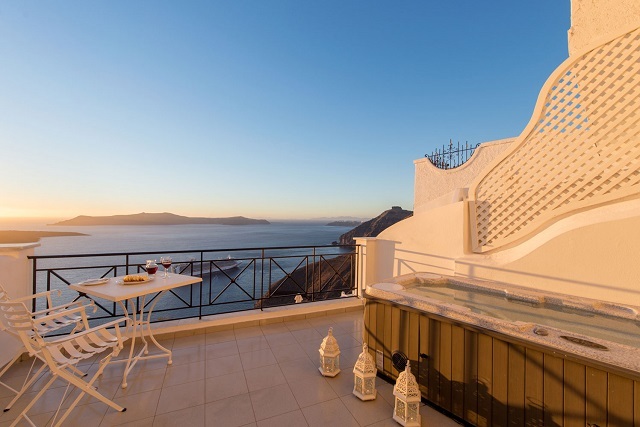 Junior Suite features an outdoor whirlpool overlooking the Caldera and Aegean Sea, free wifi, en suite bathroom with free toiletries, safety deposit box, flat screen TV and air conditioning. 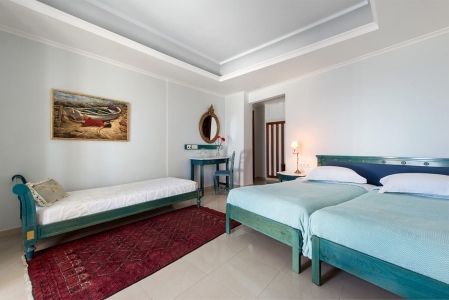 110sqm - up to 6 persons Our rooms provide all the necessary and modern comforts for a pleasurable stay. 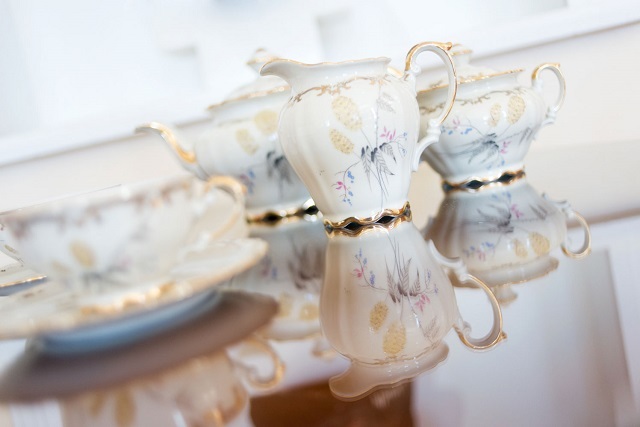 Especially for our demanding quests our rooms provide seperate telephone line with internet access. 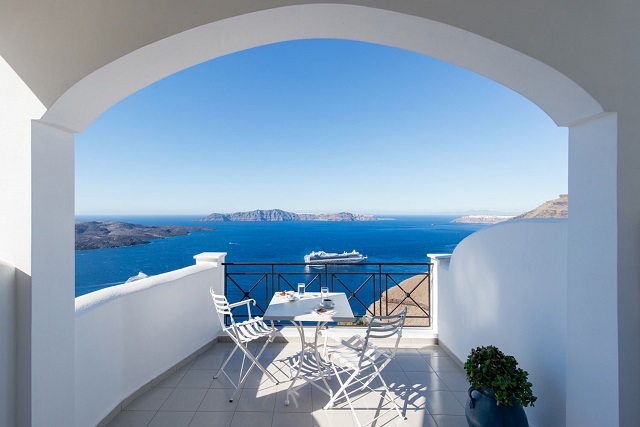 Overlooking the famous Caldera of Santorini, Hotel Villa Renos features spacious rooms opening to large furnished balconies overlooking the spectacular Santorini's sunset and the Aegean Sea. 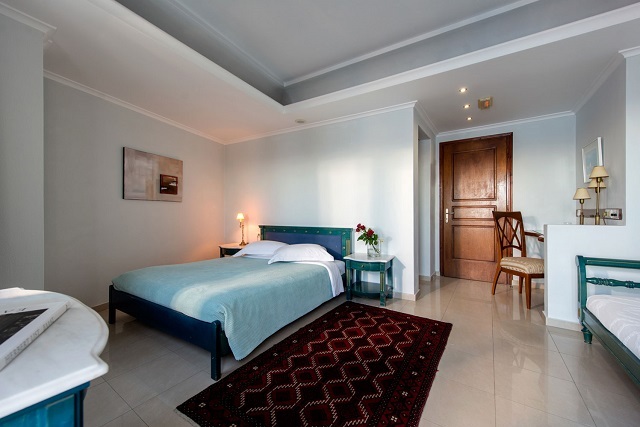 All rooms come with free wi-fi, safety deposit box, coffee – tea maker, air conditioning, ensuite bathroom and hairdryer. 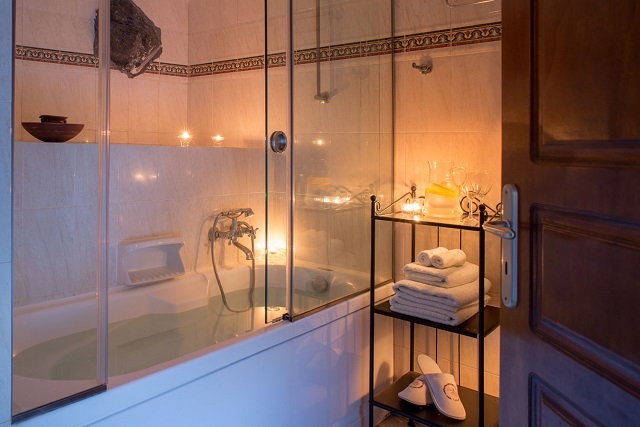 Deluxe rooms and Junior Suites offer indoor or outdoor whirlpool. 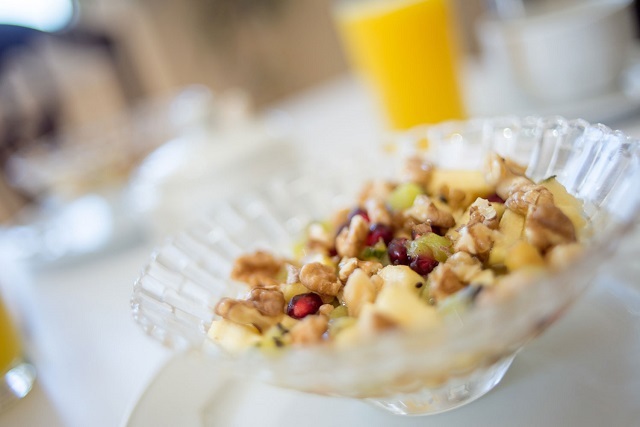 Start your day with a rich breakfast served at hotel's dining area. 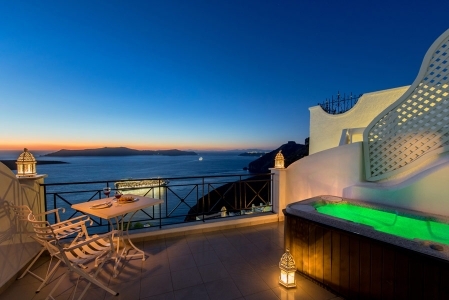 Located in Fira, Villa Renos is the ideal base to explore the beauties this unique island can offer. 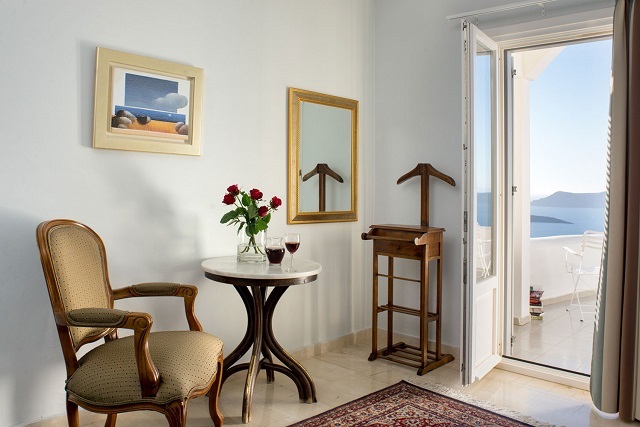 Relax at the privacy of your balcony or at hotel's bar with a glass of red visanto wine while the sun sets in the Aegean Sea. 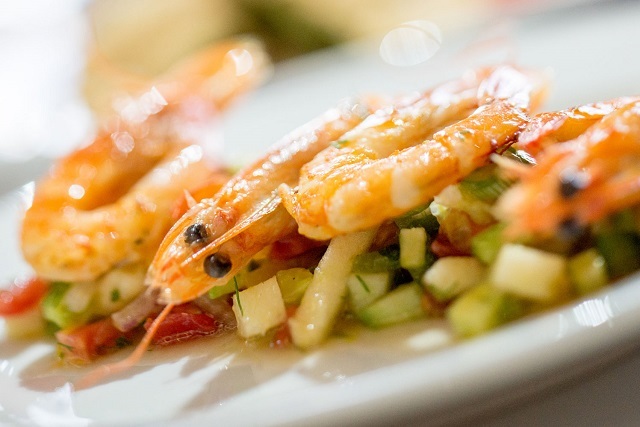 Bar, restaurants and shops are a stone's throw from Villa Renos. 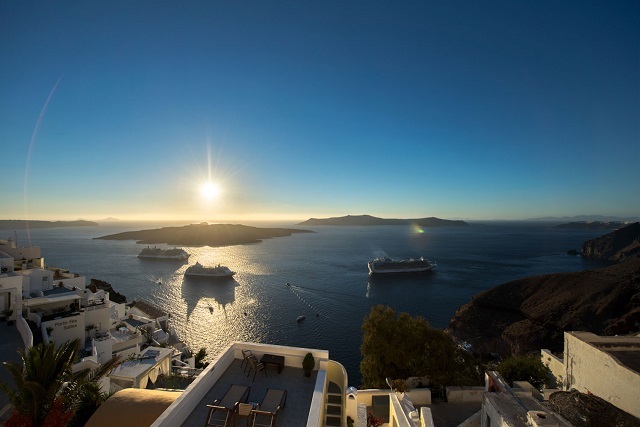 For those who wish to explore Santorini further, hotel's staff can arrange car or motorbike rental and excursion tickets. No fee charged if cancelled 21 days before arrival date. Cancelled within 21 days before arrival will result in the first night charge. If you cancel within 14 days will result in charge of the first 2 nights. If you cancel last week or you do not show up will charge the total stay. 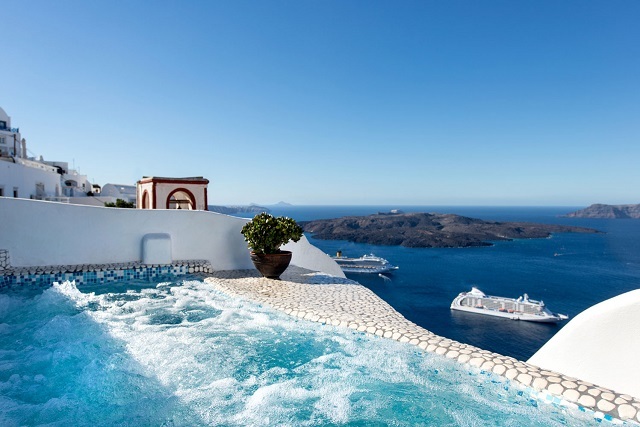 The hotel is located in the town of fira, into the old and traditional settlement of the town with easy access. to all the transportation means, banks , traditional market, museums and shops. 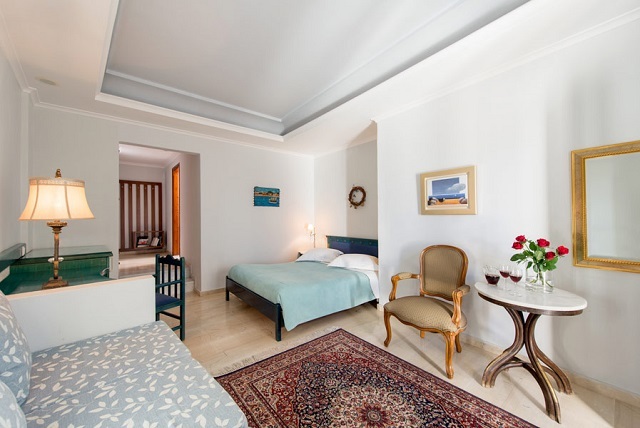 The hotel is located 5km away from the airport, 8 km away from the port and 5 km from the closest beach. Staffs are friendly with good service mind. Thank you for providing good travel information for the first time visitor like me. 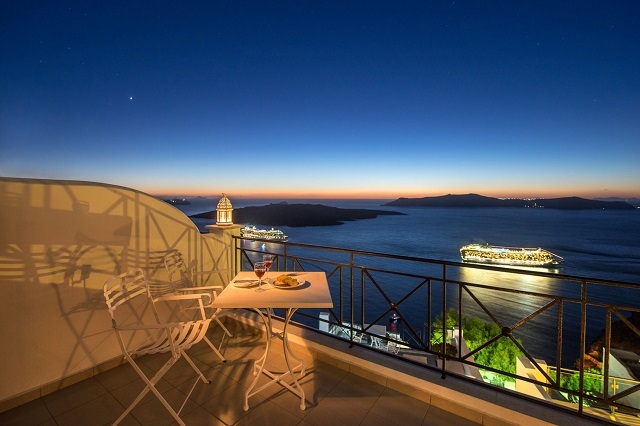 Hotel is also conveniently located with great view, especially during the sunset! Our host Vacillus was outstanding, truly into great hospitality! 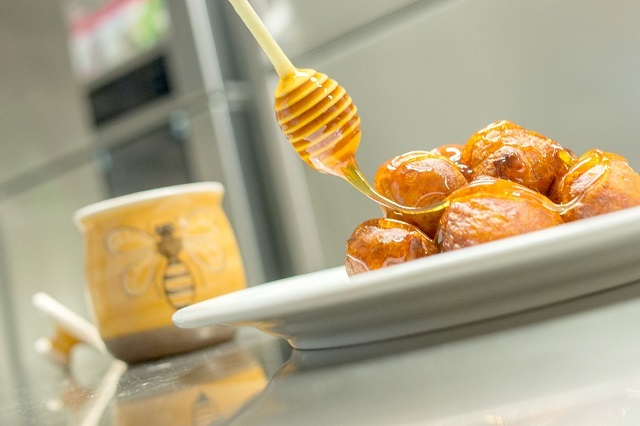 Breakfasts were unique gourmet masterpieces, different every day. 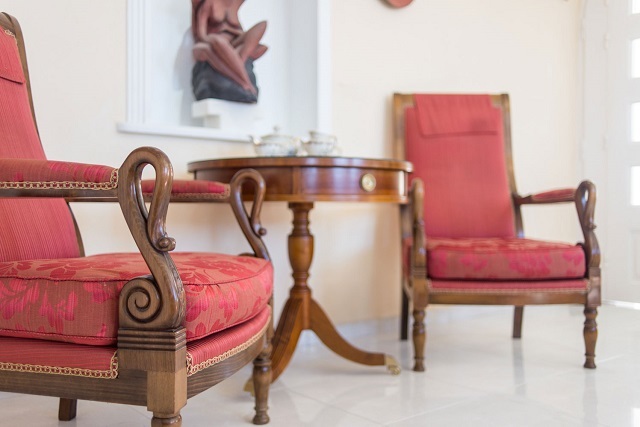 We completely enjoyed our stay at Vila Renos and we will return soon if we are fortunate! 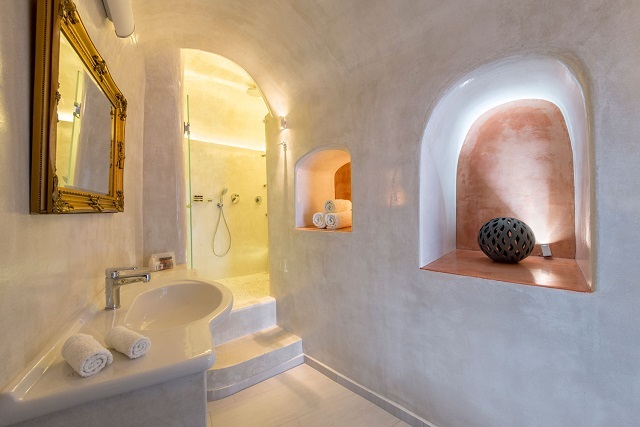 I would highly recommend Villa Renos for your stay in Santorini. 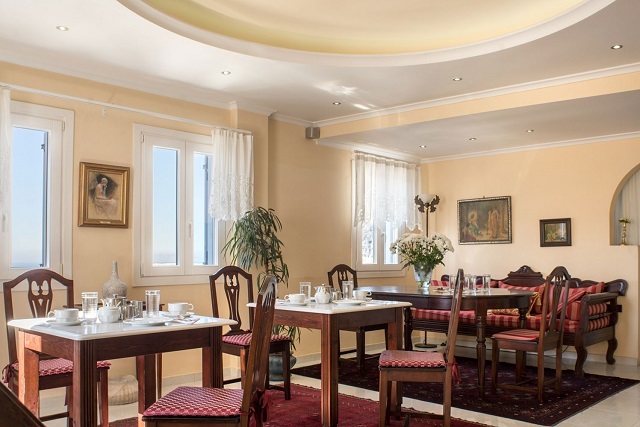 The accommodations were at the highest level and the breakfast in the morning was exceptional. 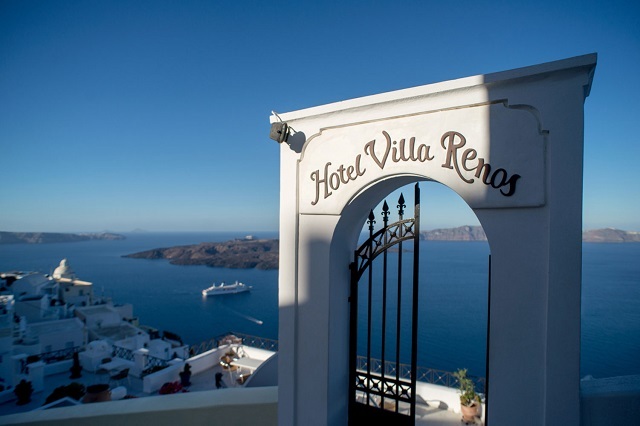 Mr. Renos and his staff were very helpful with answering questions and aiding us to have transportation for our many excursions.It was a beautiful hotel in the best location of Santorini with a personal touch. I would be happy to return! We loved our 3-night stay at this hotel because it offered all that we wanted. 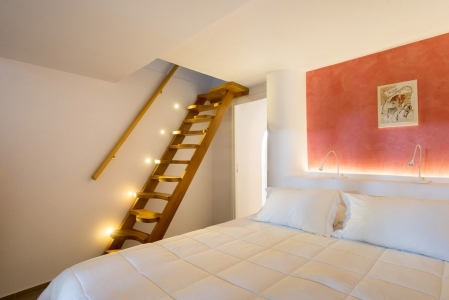 We stayed in the grand suite, which offered the perfect sunset view, and spacious, modern accommodations. Could not recommend this more highly and appreciated the dinner reservation assistance for Argo, a highlight. 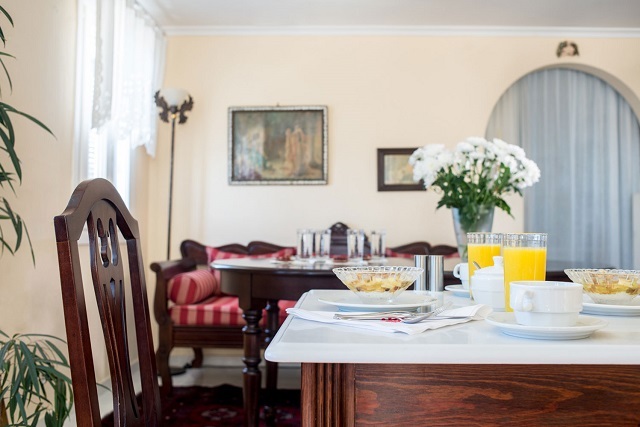 Great hospitality, fantastic and varied breakfast. We will recommend this to all friends and family. 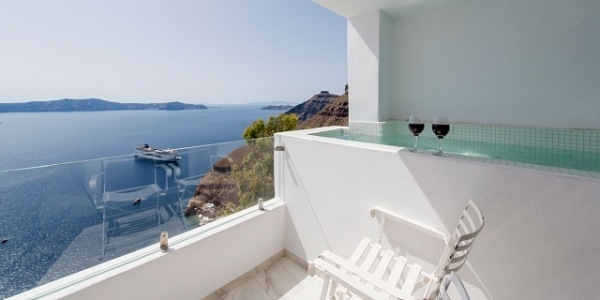 Unbelievable view of the caldera, excellent room, home made breakfast was outstanding. 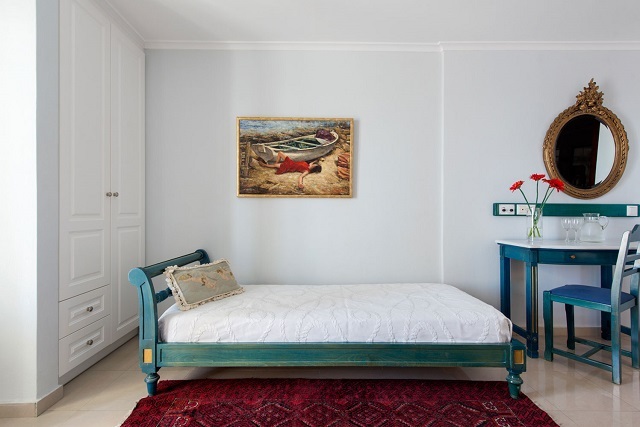 Cannot say enough about Vassilis - very friendly, knowledgeable, extremely helpful and accommodating - made our stay a very enjoyable experience. We thoroughly enjoyed our stay. We loved our stay! The breakfast everyday was delicious with a beautiful view! We watched the sunset from our room every night - there could not be a better spot! 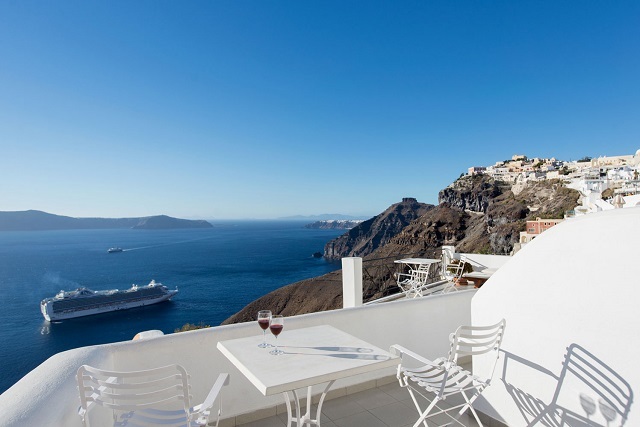 Great hotel with beautiful postcard views of the caldera and surrounding area (you will actually see the picture from the entrance on postcards and placemats at nearby shops). 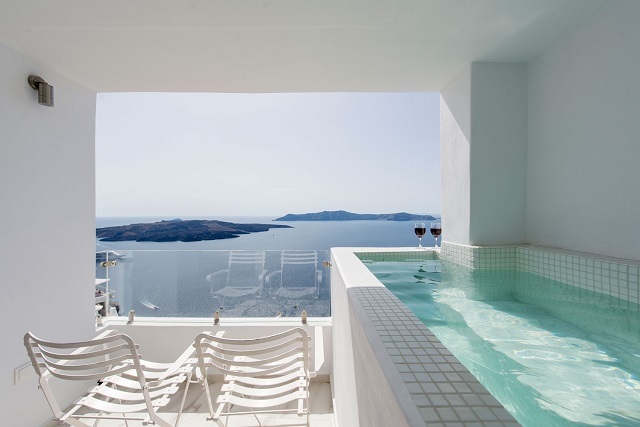 The view was amazing, the fact that we had jacuzzi on the balcony was very relaxing! The room was very very clean (the floor under the bed was spotless)!!!!! The bed was very comfortable! The breakfast was very good and extraordinary but it was nice that we could also order a simple toast! We loved the location! We were at the center but it was far from the noisy bars!!!! Everyone was very helpful and polite!!! We will definitely recommend it to others!!! We thoroughly enjoyed our stay here! There was a little confusion upon checkin because we were under the impression there would be two separate beds in the room, which there were not. It worked out fine however. The view from our balcony was unbeatable, and the breakfasts prepared each morning were the best food we had during our entire trip. Cannot find fault with the hotel, the owner and the staff. Love this place, amazing view, beautiful suite we stayed at. The staff were all very polite and friendly. Would definitely stay here again, and highly recommend this place to anyone. 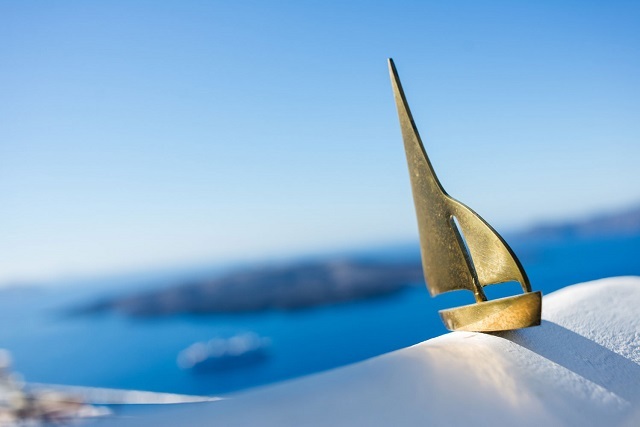 We had a delightful time in Santorini and felt that the hotel's location is perfect for enjoying the town of Fira. 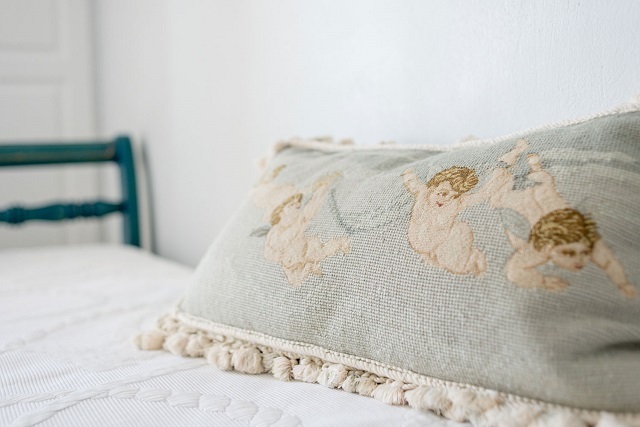 It is clean, neat and the staff is helpful, always pleasant and most accommodating. The steep stairs and climb to the main street may be a drawback to both young families and older adults. My husband and I were here for part of our honeymoon. Villa Renos was fantastic. Our room was just like the pictures. 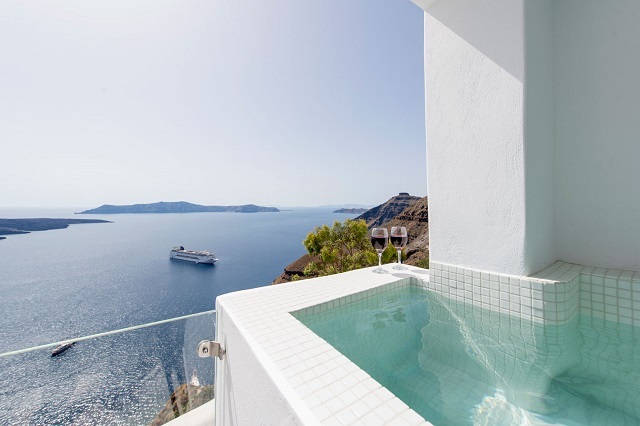 We enjoyed the private hot tub and the views from the balcony. The breakfasts were delicious. All of the staff was professional and helpful. We did not have any issues or complaints. 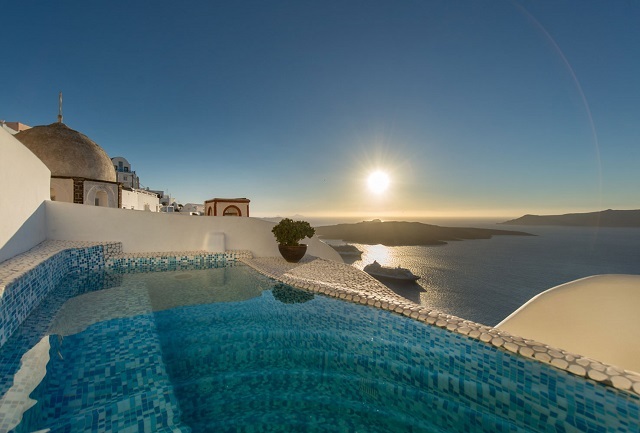 Would definitely stay here again if we are back in Santorini! 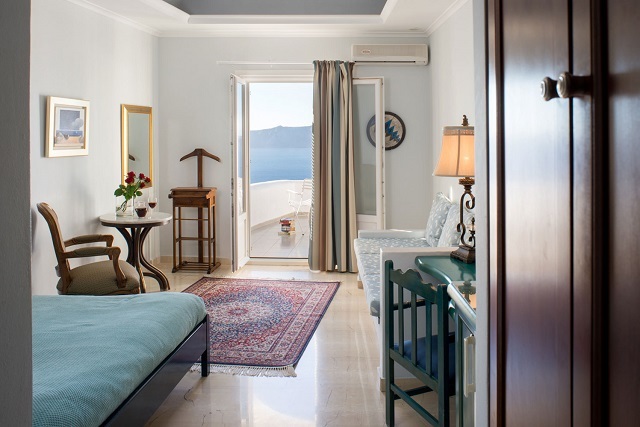 beautiful room.wonderful view.friendly staffs.best greek food I ever had. The Hotel belongs to a chain with the following Hotels.